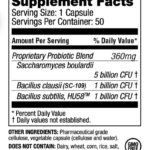 RestorFlora is a probiotic supplement that combines well-studied and widely-used probiotic strains Saccharomyces Boulardii, Bacillus Subtilis HU58, and Bacillus Clausii. 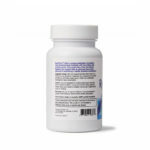 This combination of probiotic yeast and bacteria offers comprehensive digestive flora support with an advanced, dual-action approach to maintain a healthy intestinal environment. Saccharomyces boulardii is well studied and extensively used for its ability to curb digestive issues associated with antibiotic use. 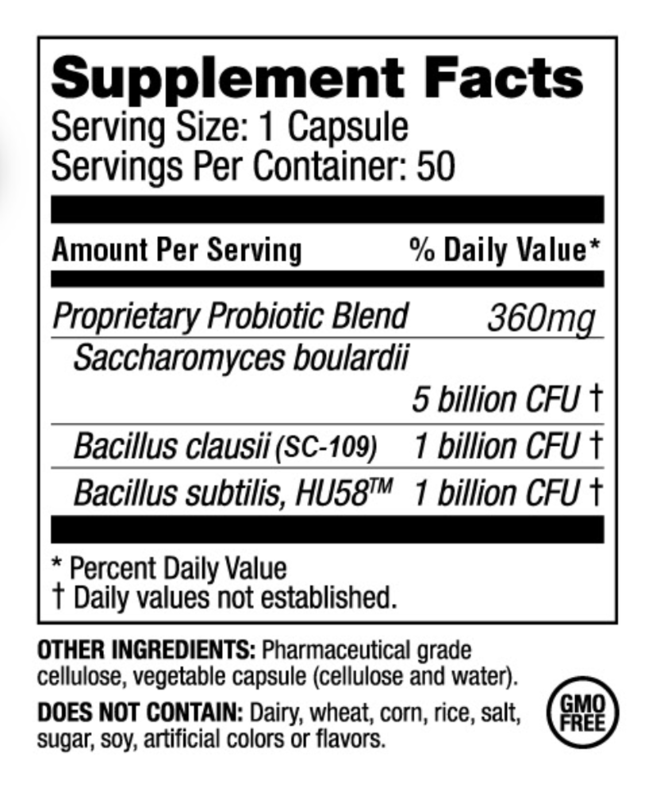 However, a product containing only S. boulardii has limitations with regards to other probiotic functions. 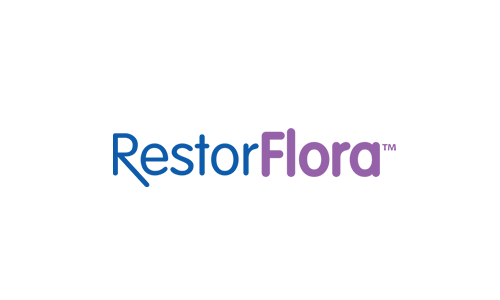 RestorFlora represents a significant advancement that overcomes these limitations with the addition of Bacillus Subtilis HU58 and Bacillus Clausii. 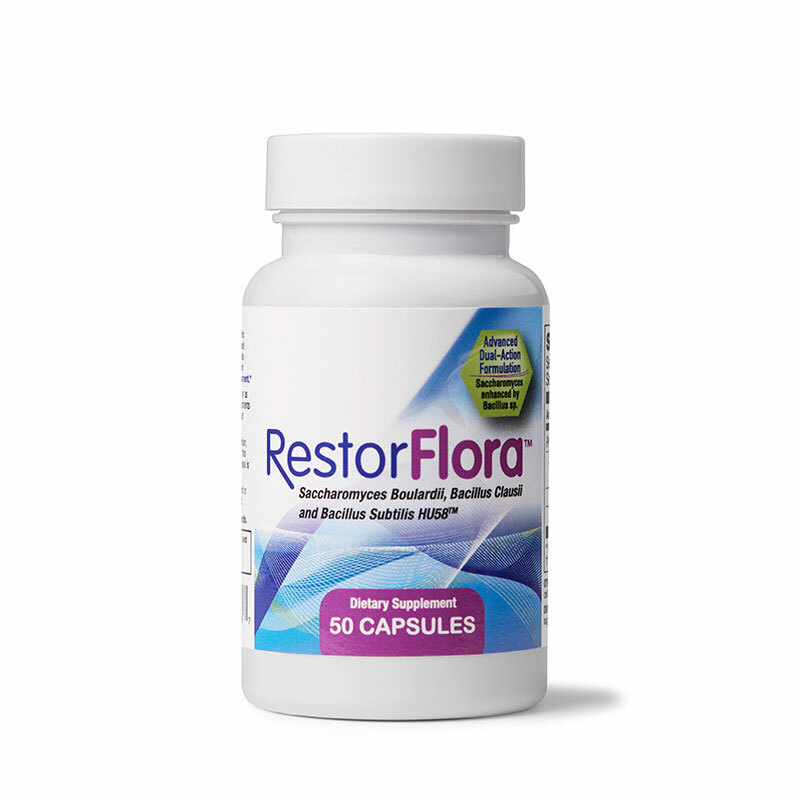 RestorFlora provides competitive exclusion of bad and potentially harmful organisms, as well as the ability to colonize in the digestive tract to produce favorable immune responses. Antibiotic use, daily stresses, poor diets, chemicals, age, fluoride exposure, etc. makes the digestive system susceptible to pathogenic bacteria and yeast overgrowth. 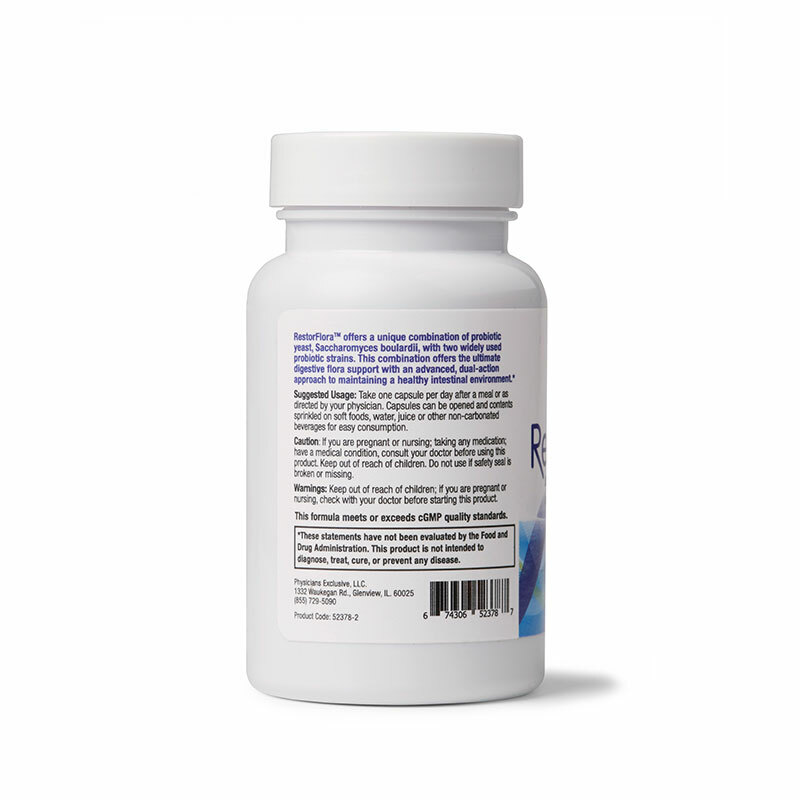 RestorFlora is formulated with Bacillus Subtilis HU58 and Bacillus Clausii; both species have been shown to be potent competitive exclusions probiotics and widely used as a protective probiotic for nearly 60 years in the pharmaceutical industry in Europe and Asia. Both bacillus species found in RestorFlora have been demonstrated to favor an anti-inflammatory reaction in the digestive tract. Inflammation in the digestive system is at the root of many disorders both systemically and intestinal. Cellular energy output is largely controlled by digestive health. Studies have demonstrated that the short-chain fatty acids produced by RestorFlora help to maintain a healthy fasting blood glucose, fasting insulin and insulin tolerance, which improves sugar metabolism, so you get a better balance of energy from fat and sugars. 1-2 capsule per day with a meal, or as directed by your physician. Capsules may be opened to sprinkle contents on soft foods, water, juice, or other non-carbonated beverages for easy consumption. Czerucka D, Dahan S, Mograbi B, et al. Saccharomyces boulardii preserves the barrier function and modulates the signal transduction pathway induced in enteropathogenic Escherichia coli-infected T84 cells. Infect Immun. 2000 Oct;68(10):5998-6004. Sougioultzis S, Simeonidis S, Bhaskar KR, et al. Saccharomyces boulardii produces a soluble anti-inflammatory factor that inhibits NF-kappaB-mediated IL-8 gene expression. Biochem Biophys Res Commun. 2006 Apr 28;343(1):69-76.